Horse Bests Other Horse: News came this week that old music outsold new music for the first time in recorded history — or, in this case, recorded recorded history. Adam Puglsey lays out the situation at chartattack.com. Of course, as he also writes: “Keep in mind that these stats don’t include album streams, but regardless, it’s a significant turning point.”Which is to say, this may be like saying one breed of horse outsold another breed of horse for the first time after the introduction of the automobile. The History of the Phone Is the Future of the Phone: Speaking of ahistoricism and technology, at medium.com, Peter Rojas talks about a new phone service called Unmute. It’s an app for conducting phone calls, with one added feature: “anyone can listen in on the calls. In fact, having a conversation in public is the whole point of Unmute, which is why we find it so compelling as a product.”This future-tech platform is vaguely reminiscent of what was, before the advent of widespread individual-household phone service, called a party line. Older baby boomers and their parents can recall apartment buildings and rural regions alike having shared lines. Pick up the phone at the wrong — or, depending on your predilections, right — moment and you get not only an earful of local gossip, but you can participate, as well. More on Unmute, which unlike party lines will provide an MP3 at the end of the call, at onunmute.com. The Tantalizing Promise of the Applbum: Apps have been the new albums — the “applbum,”perhaps — for awhile now, and though the hybrid isn’t exactly a fulfilled promise, it continues to bear fruit. Adrift, the blissful and expertly glacial generative ambient experience by Loscil (aka Scott Morgan), was released for iOS late last year, and in a (sadly) rare instance of platform equity it popped up this week in an Android version. Well, not directly Android. It’s not in the Google Play Android app store, but in Amazon’s app bazaar. I asked Loscil/Morgan why via Twitter, and he explained that the Android max size was 100 megabytes (“i can’t afford the dev cost of adding expansion packs”), while Amazon has no app-size cap. The size is due to the app’s expansive sonic content that yields its generative (i.e., ever-changing) listening experience. … Meanwhile, Massive Attack has released a new album ”¦ that is, app, titled Fantom, that is billed as a sensory experience. Presumably “sensory”implies “interactive,”since music is itself sensory and “interactive”is simply a term that may have outlived its utility before that utility had actually been realized. The thefantom.co site explains: “The remixes reflect your movement and balance, the time of day or night, your location and your surroundings as captured by your device’s camera.”At the moment the link to the iTunes store isn’t yielding the app, but Tom Fenwick at motherboard.vice.com has some in-depth coverage, including the fact that one of the developers is Rob Thomas. The article doesn’t mention this, but Thomas is the former Chief Creative Office of Reality Jockey, where he helped develop the app RJDJ, which used a unique “scenes”scenario to alter in real time the sounds your phone or iPod picked up. RJDJ led, in turn, to several other apps, including ones associated with Christopher Nolan films, such as Inception. More from Thomas himself at soundcloud.com/dizzybanjo. 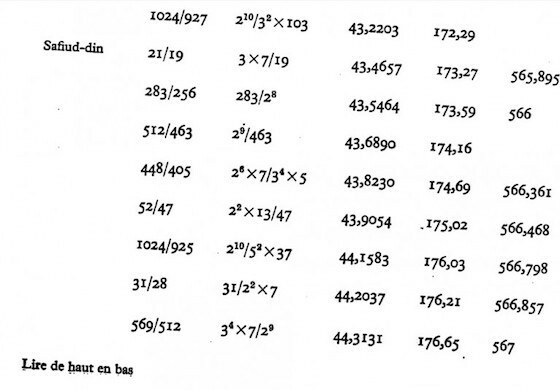 As mistakes in tonal esoterica go, Gann notes, this one actually has some currency: “this is one of the intervals used in The Well-Tuned Piano”(one of La Monte Young’s great works). Gann, whose long-ago Village Voice music criticism was essential reading for me and many others back in the day, blogs at artsjournal.com/postclassic, where this notice first appeared. His Danielou article includes a link to a complete PDF of the Tableau book. This first appeared in the January 26, 2016, edition of the free Disquiet “This Week in Sound”email newsletter: tinyletter.com/disquiet. There are many types of music apps — that is, apps employed in the making of music. In terms of the intent packed into those apps, through both features and branding, they can been seen, very broadly, to fall into two categories: first, apps that miniaturize for our phone/tablet age tools that existed in the past; second, apps that go new places. As a longtime follower of digital music-making tools intended for use on the go, PalmSounds.net blogger Ashley Elsdon falls firmly in the latter camp — a subject explored in depth in an interview I did with him late last year (“Immediacy + Accessibility = Joy”). When I did the interview, I was very familiar with Elsdon’s fixation on mobile music making, from its early-ish fledgling flourishing on the defunct Palm platform, on through the golden age of iOS apps. What I wasn’t familiar with was Elsdon’s own music. I shouldn’t have been surprised, though, to hear these recent experiments of his for digitally processed ukulele. All three employ different apps (as detailed in a short post at palmsounds.net) to both halo and process the ukulele’s unique, casual, often gestural tonalities. They’re quite distinct recordings from each other, but they also hold together as a set. “Ukulele Exploration 1” in particular rewards repeat listening, with its dubby echoes of gentle plucking and strums. Tracks originally posted at soundcloud.com/palmsounds. In recent years, there has been much discussion about distinctions between “ambient”music and “new age”music. It is quite likely that the primary distinction between the two is a matter of just how foregrounded are spiritual matters — in the music’s conception, and in its presumed consumption. If anyone can weigh in authoritatively on such distinctions, it is Laraaji, the longtime, holistic-minded musician whose most prominent release, 1980’s Ambient 3: Days of Radiance (Editions EG), was produced by a world-famous skeptic: ambient godfather Brian Eno. As has been well documented over the years, Eno came upon Laraaji playing his electric-enhanced zither in Manhattan’s Washington Square Park. That chance encounter helped introduce Laraaji to the world, and to this day he travels widely and records and performs frequently, often as part of spiritual conferences. 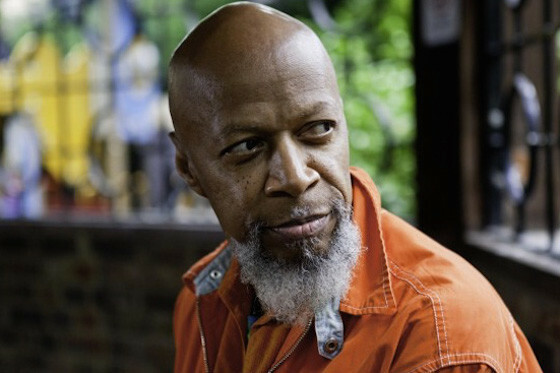 Born Edward Larry Gordon in 1943, and later taking the name Laraaji as part of a spiritual awakening, he studied music at the historically black college Howard University and then moved to New York City to pursue a career in standup comedy. The impetus for this interview was the announced release of three of his archival cassette tapes by Leaving Records, dating from just before and just after Days of Radiance. The collection is titled All in One Peace, and it contains the lush, aquatic, and deeply trippy Lotus Collage (1978), Unicorns in Paradise (1981), and Connecting with the Inner Healer Through Music (1983). 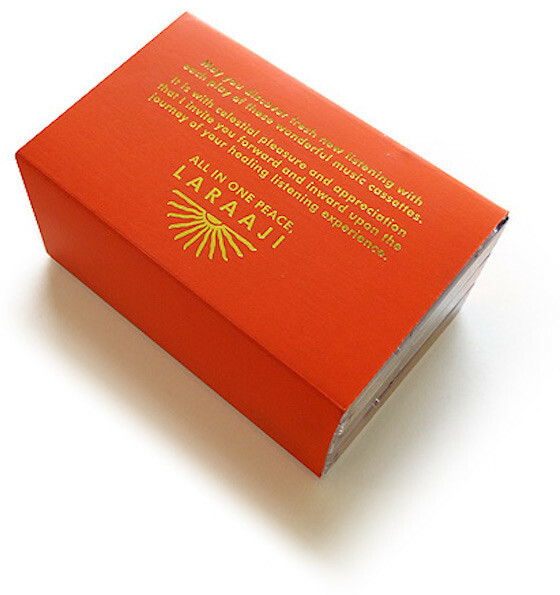 They are being made available as cassettes not simply because the audience for cassettes has expanded in recent years, but because cassettes — easy to transport, inexpensive to reproduce — were the medium on which Laraaji originally sold his music when he busked in Washington Square Park. In advance of the interview, which was spurred on by Boing Boing’s Xeni Jardin, with whom I share an enthusiasm for Laraaji, I asked her and several musicians I admire if they had any questions for Laraaji. To begin with, his name is pronounced as three straight, even syllables, none of them emphasized. In addition to Jardin’s question about the connection between music and healing, I asked for Scanner (aka Robin Rimbaud) about Laraaji’s thoughts on melancholia in music — this due to Laraaji’s profound emphasis on laughter — and for Greg Davis I asked about the origins of a specific record album, Essence Universe. In the interview, Laraaji talks about many things, including what Washington Square Park was like back in the day, how he achieves his watery sonics, bridging the spiritual gap with the great skeptic Brian Eno, finding peace in the process of tuning the zither’s 36 strings, and his early career as a standup comic. Marc Weidenbaum: How did this reissue collection, these three albums, come to be? Laraaji: I think it stared with a gentleman named Douglas Mcgowan of Yoga Records who, maybe two years ago, when he was releasing an LP of mine he mentioned some people in California who might be interested, as an independent company, to release my music. Over about a year or two, eventually he connected me with Matthewdavid McQueen, in Los Angeles. Well, actually, I met David and his wife at an event that myself and a partner and music collaborator gave in Los Angeles — I think a year and a half ago, in October. And he met me there and handed me a CD and I met his wife, and maybe about a half year later he contacted me and mentioned that he was very much interested in checking out my early music on cassette, and asked if I sent him out whatever I had he would go over them and examine them and take it from there, on what to do with them. I sent him out a bunch of my old cassettes and he found three that he wanted to release immediately and he got my approval, very easy agreement, and he began to work on preparing the cassettes as close to the way they looked back when I did them myself. With Leaving Records and Stones Throw and all of our connections since I met him in Los Angeles, about a year and a half ago, have been through email and phone. Laraaji: For that one I had a limited release on it because it was really for the people who are familiar with that annual excursion conference that takes in Greensboro ”“ the South Eastern Spiritual Conference. I occasionally presented workshops for music for these conferences over the years. One year, 1983, I offered a three-day workshop called “Connecting with the Inner Healer,”and I prepared music for the people in the class. This is the music that came out of that experience. So I hadn’t tried to release that set too widely, mostly for people who are familiar with my workshop programs. Weidenbaum: It’s incredible how little mention of it there is on Google as of now, just nine search returns as of today [July 21, 2015], several of which are for the phrase but have nothing to do, actually, with your album. Laraaji: Yes, I’m not a great big promoter. I delegate that to other qualified people. I’m surprised there’s that many mentions. Weidenbaum: I’d imagined it must have some sort of unique provenance. Please elaborate on Connecting with the Inner Healer. I want to also talk about your music and life, but because of the timing of these re-releases, I want to focus first on these albums, especially this one, about which so little is known. Was the music recorded at the conference? There are several dozen tracks thus far in the “sound diary” credited on SoundCloud to Corruption, who gives as a residence Funabashi, Japan. Many are noisy escapades, tagged simply as “sound diary,” while the one dated “2013.11.19” and given the subtitle “like a moth to a candle” bears a second tag: Nanoloop. That’s the name of a popular piece of electronic music software that originated on the Nintendo Gameboy and has been since ported to iOS and Android. What was, back in 1998, an esoteric dream of handheld music-making has become pop culture, an everyday activity. In Corruption’s hands, Nanoloop makes sequences of shiny chiming jangles that ebb and flow like a low-resolution tide. There’s a glitchy quality to it at times, lending the work a welcome complexity, a dark undercurrent to its slow pace. Corruption does not identify which edition of Nanoloop is employed. Track originally posted for free download at soundcloud.com/corrption. More on Nanoloop at nanoloop.com. The above screenshots are from the Android version. These are two things that I think Geoff Manaugh, editor-in-chief of the technology and design blog Gizmodo.com, didn’t know about me when he asked if I’d consider bringing Disquiet.com beneath his website’s expanding umbrella. 1: My “to re-blog” bookmark file has been packed in recent months with scores of items from pretty much all of the Gizmodo-affiliated sites — not just Gizmodo, but io9.com, Lifehacker, Jalopnik, Gawker, and Kotaku. Probably Jezebel and Deadspin, too, but the file is too thick for me to tell. 2: Pretty much the first thing that I read every morning with my coffee — well, every weekday morning — is the “Morning Spoilers” at io9.com, the great science fiction website that is part of the Gawker network that also contains Gizmodo. I knew Manaugh’s work from BLDGBLOG and, before that, Dwell Magazine. He’d previously invited me to involve the weekly experimental music/sound project series that I run, the Disquiet Junto, in the course on the architecture of the San Andreas Fault that he taught in spring 2013 at Columbia University’s graduate school of architecture. And I am excited to work with him again. And so, there is now a cozy disquiet.gizmodo.com subdomain URL where I’ll be syndicating — simulposting — material from Disquiet.com, as well as doing original straight-to-Gizmodo writing. I’m hopeful that members of the Gizmodo readership might further expand the already sizable ranks of the Disquiet Junto music projects (we just completed one based on a post from Kotaku), and I’ll be posting notes from the course I teach on “sound in the media landscape” at the Academy of Art here in San Francisco. Playing with Audio: If everything is, indeed, a remix, that is a case most clearly made in music and experimental sound. From the field recordings that infuse much ambient music to the sampling of hip-hop to the rapturous creative reuse that proliferates on YouTube and elsewhere, music as raw material is one of the most exciting developments of our time. Terms like “remix” and “mashup” and “mixtape” can been seen to have originated or otherwise gained cachet in music, and as they expand into other media, we learn more about them, about the role such activities play in culture. And through the rise of audio-game apps, especially in iOS, such “playing with sound” has become all the more common — not just the work of musicians but of audiences, creating a kind of “active listening.” This notion of reuse, of learning about music and sound by how it is employed after the fact, plays a big role in my forthcoming book for the 33 1/3 series. My book is about Aphex Twin’s album Selected Ambient Works Volume II, and it will be published on February 13, 2014, just weeks ahead of the record’s 20th anniversary. As part of my research for the book, I spoke with many individuals who had come to appreciate the Aphex Twin album by engaging with it in their own work, from composers who had transcribed it for more “traditional” instruments (such as chamber ensembles and solo guitar), to choreographers and sound designers, to film directors. All of which said, I’m not 100-percent clear what form my disquiet.gizmodo.com activity will take. I’m looking forward to experimenting in the space. I’ll certainly be co-posting material from Disquiet.com, but I’m also planning on engaging with Gizmodo itself, and with its broader network of sites. I’ve already, in advance of this post, begun re-blogging material from Gizmodo and from Gizmodo-affiliated sites: not just “sharing” (in the UI terminology of the Kinja CMS that powers the network) but adding some contextual information, thoughts, tangents, details. I’m enthusiastic about Kinja, in particular how it blurs the lines between author and reader. I like that a reply I make to a post about a newly recreated instrument by Leonardo Da Vinci can then appear in my own feed, leading readers back to the original site, where they themselves might join in the conversation. Kinja seems uniquely focused on multimedia as a form of commentary — like many CMS systems, it allows animated GIFs and short videos to serve as blog comments unto themselves, but it goes the step further of allowing users to delineate rectangular sub-sections of previously posted images and comment on those. I’m intrigued to see how sound can fit into that approach. (It’s no surprise to me that Kinja is innovative in this regard — it’s on Lifehacker that I first learned about the syntax known as “markdown.”) I think that all, cumulatively, makes for a fascinating media apparatus, and I want to explore it. While I typed this post, it was Tuesday in San Francisco. I live in the Outer Richmond District, just north of Golden Gate Park and a little over a mile from the Pacific Ocean. The season’s first torrential rain has passed, and so the city sounds considerably more quiet than it did just a few days ago. No longer is the noise of passing automobiles amplified and augmented by the rush of water, and the roof above my desk is no longer being pummeled. But where there is the seeming peace of this relative quiet, there is also an increased diversity of listening material. The ear can hear further, as it were — not just to conversations in the street and to passing cars, but to construction blocks away, to leaf blowers, to a seaplane overhead, to the sound of a truck backing up at some considerable distance, and to the many birds that (unlike what I was accustomed to, growing up on the north shore of New York’s Long Island) do not all vacate the area come winter. It is shortly past noon as I hit the button to make this post go live. Church bells have sung a duet with the gurgling in my belly to remind me it is time for lunch. And because it is Tuesday, the city’s civic warning system has rung out.